For Urban Initiatives and kids all across Chicago, September is back-to-school month! 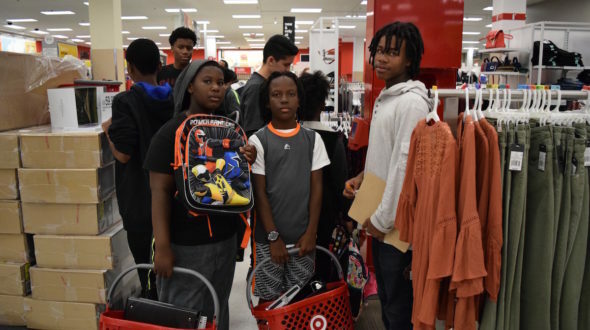 On September 1, Urban Initiatives students got on the school bus early for a back-to-school shopping spree made possible by the support of Target, one of UI’s key partners. 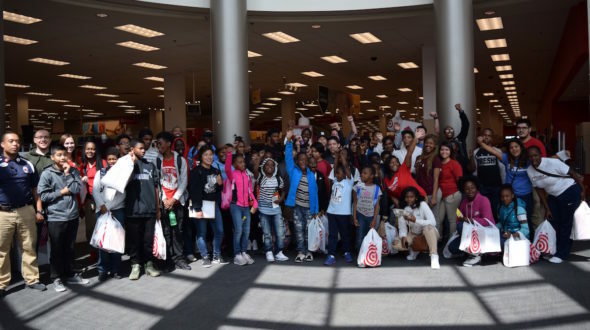 20 of the high school students in UI’s first official Coach for Success cohort helped younger kids from Lawndale Community Academy navigate the Target store in the South Loop and fill their shopping baskets with notebooks, pencils, pencil cases, and lunch bags, plus other school equipment essentials. Some of the students even picked out brand new backpacks featuring their favorite characters and shows — Elsa from Frozen, the Teenage Mutant Ninja Turtles, and Power Rangers. Each elementary school student had a $50 Target gift card, thanks to donations from UI’s Board of Directors, to use. With the help of their high school coaches, they carefully budgeted for their equipment needs, with the high school students assisting with their calculations and using the Target price scanners to double and triple check their math. 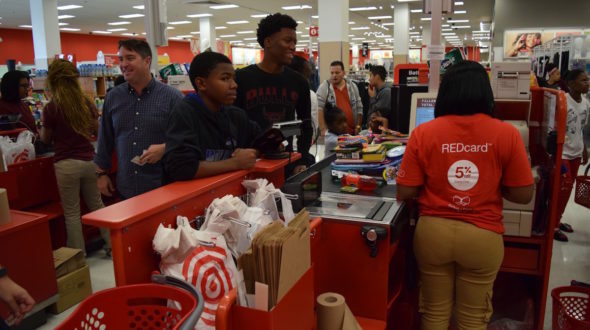 The Lawndale students made their purchases at specially-marked checkout lanes in the store, and the UI team was pleasantly surprised to learn that not one of the students had gone over budget! 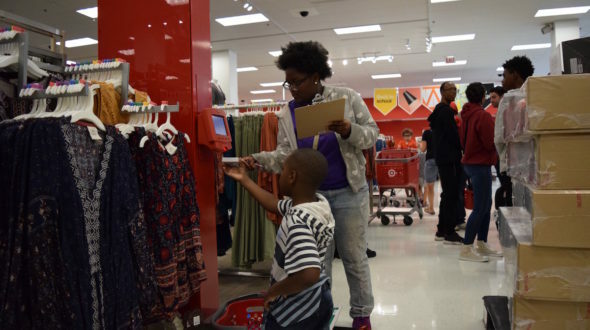 After the younger kids finished shopping, each high school student was presented with a $50 Target gift card — with Target generously matching each Board Member’s earlier contribution — so that they could return to any Target store on their own time to purchase whatever they might need for themselves. 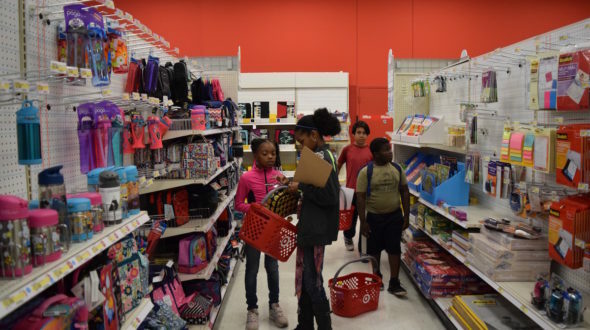 We are incredibly grateful for Target’s support in ensuring our students are equipped to succeed in the new school year, and for their overall incredible support of our programming in schools throughout Chicago. In the 2017-2018 school year, Target will fund UI’s Play with Potential program with a $25,000 grant, renewing their support of the program from the previous school year. Play with Potential is our structured recess program that aims to maximize the health, academic, and social-emotional benefits of recess periods as well as improve the overall health environment of school communities. Through this program, UI helps to strengthen school culture and climate while addressing the specific needs of each partner school. 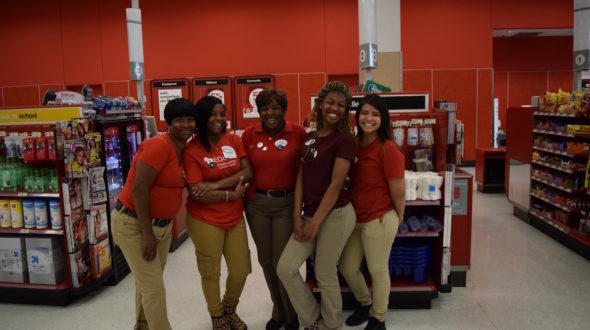 Thanks to amazing corporate partners like Target, Urban Initiatives continues to increase our ability to impact the lives of Chicago’s underserved youth through sport and play. Together, we are leveraging the power of public-private partnerships to build the city’s next generation of young leaders. Watch a brief video of the shopping event here.